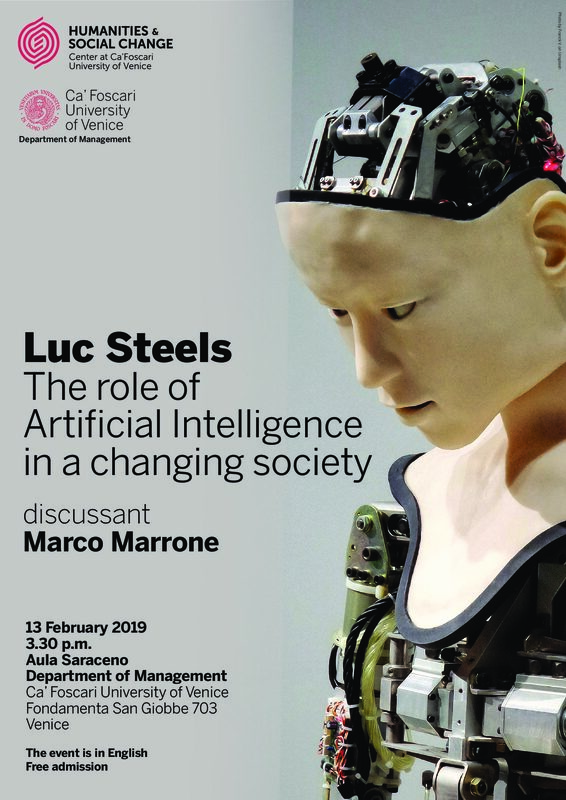 The Venice Center for the Humanities and Social Change presents: Luc Steels, The Role of Artificial Intelligence in a Changing Society. With HSC Fellow Marco Marrone as discussant. Venice, 13/02/2019 at 3.30 p.m. Artificial Intelligence is in the news. Although the techniques, methods and software components of AI have been under development for decades, it is only recently that the deep potential of AI for transforming many aspects of society is beginning to be felt. This talk first clarifies what Artificial Intelligence is, including what its limits are. It then discusses various areas of activity where there is currently a very active exploration of AI, more specifically in media, work, science and the arts. I will also raise some questions in relation to the ethical and legal issues of AI.